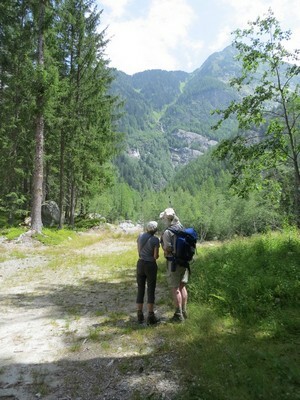 Today we took the Val Veni bus again, but this time all four of us walked down on tracks parallel to the valley road. 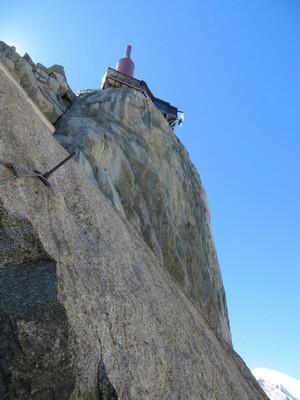 The route was partly shaded and took us past the odd house or two. One of them sold welcome cold drinks. 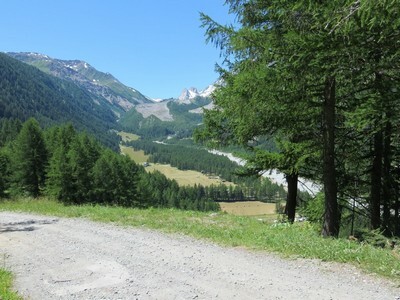 The only problem was when we rejoined the main valley road to catch the bus back to Courmayeur. The bus was absolutely packed with people. Happily they all breathed in and we managed to get aboard. 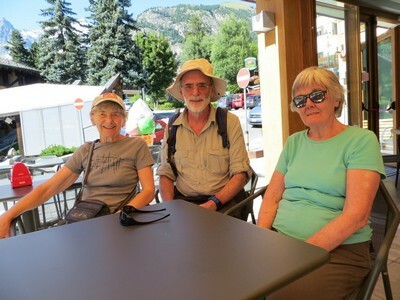 Once back to Courmayeur and out of the packed bus we needed a little refreshment. 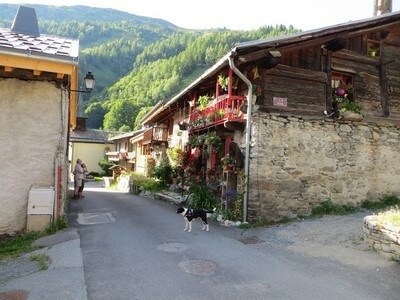 Then home to "our" house and a tidy-up for a good dinner at Le Vieux Pommier. 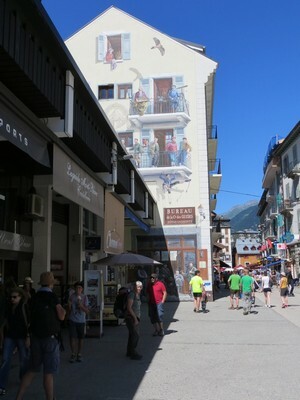 Today we start the first stage of the journey back home, leaving our comfortable accomodation in Courmayeur. 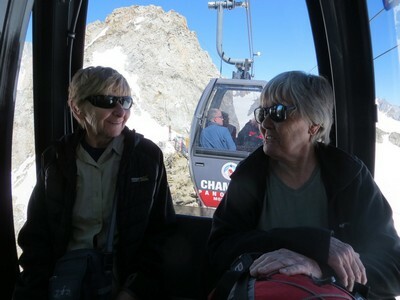 Initially we took a bus up to La Palud and then two cable car rides up to the magnificent new cable car station at Pointe Helbronner. 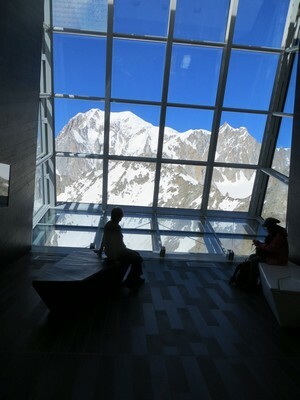 The building is well up above the snowline and there are viewing platforms galore. One is high enough to see all the distant mountains. You can watch the clusters of little pods in which we would be travelling to cross to France. It would shortly be our turn to take this ride. 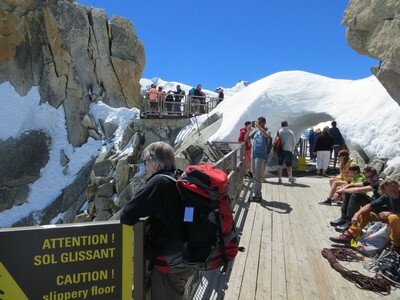 Meanwhile we walked down the staircase to what had, a few years back, been an area where one could walk on the snow. 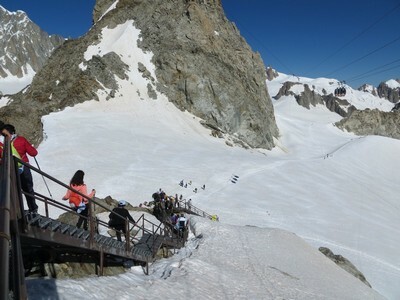 On this visit the stairs did not lead fully down to the surface of the snow. So we walked back up again. 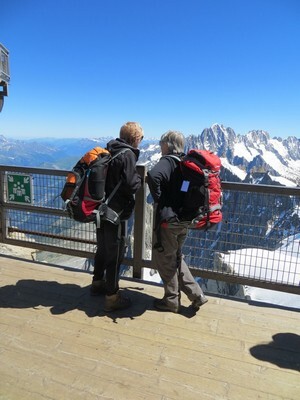 As we walked back up we got a good view of the clusters of small cabins in which we would shortly be travelling. 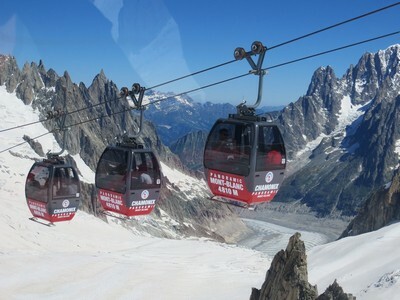 These take their passengers high over the snows of the Mer de Glace to reach the French side of the mountains. 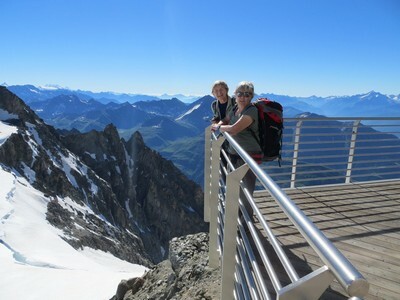 We then went back to the viewing deck to stand in the sun watching people take their photos. 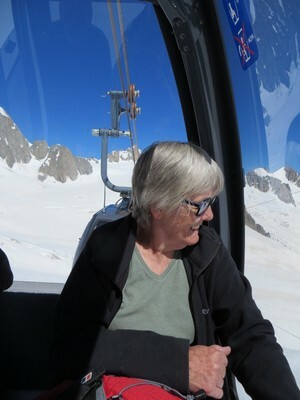 After that we had a little while in the luxurious interior while looking out at the mountains. Each cabin holds four people - just right for the four of us. There is enough room for some luggage. Remember that we each carried all of the luggage that had come on holiday with us! 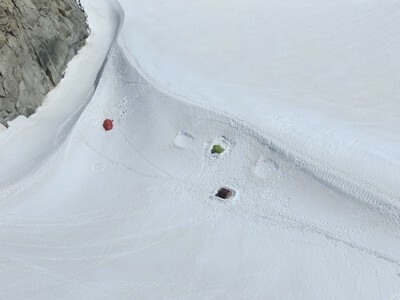 It is surprising to see that a few people were camping on the snows of the glaciers. Not many though! 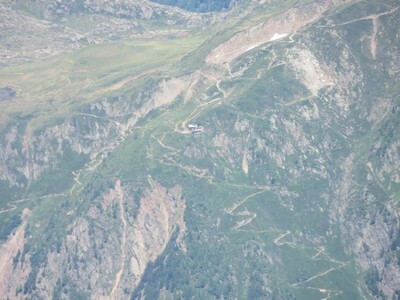 The cabins returning from the French side pass by quite close. One gets a good view of them painted a glowing red which contrasts with the white, blue and browns of their surroundings. At intervals the motion stops while passengers get on and off at the terminal stations. 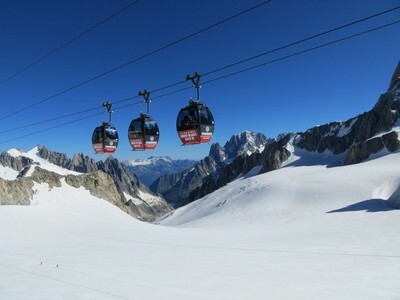 This is a good feature since it gives one more time to look at the spectacular scenery. A check on Google Maps shows the journey to be 5km long, with perhaps about 10 of these pauses on the way. 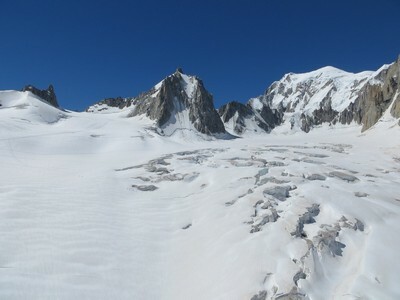 The surface below is heavily crevassed in some areas and unbroken in the majority of it. All of it has a perfect white covering of snow. 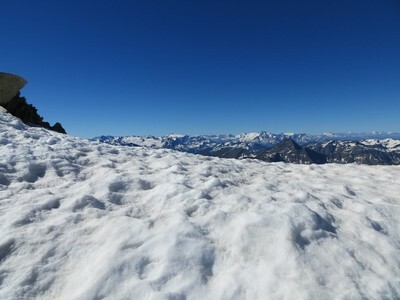 It is curious to be so close to the glaciers and to be looking down on them. 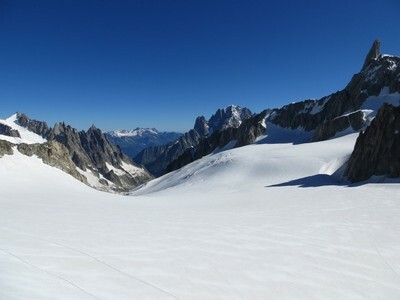 This is a view one rarely gets on foot unless you are traversing a steep cliff over a glacier: that would be quite an uncommon event. 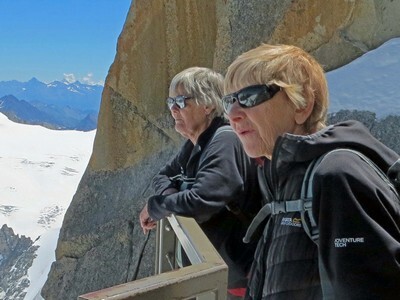 The spectacular journey is over only too soon, but it will leave abiding memories. 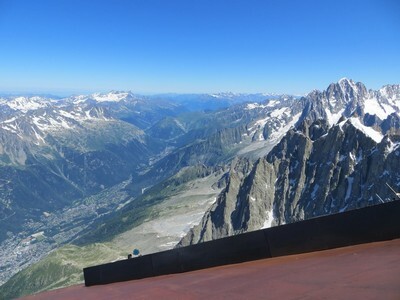 At the Aiguille du Midi on the French side, you note the rusty metal covers on the walkways created for tourists. One must not complain of the tourist features as shortly we would be using them ourselves to see the spectacular surrounding scenery. 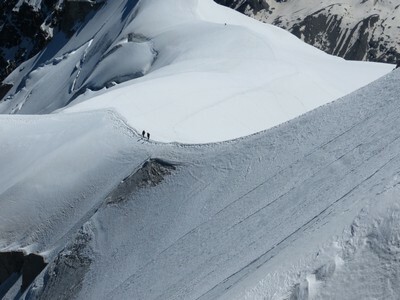 One entertaining sight is to watch climbers making their way up or down the snow ridge between the Midi and the glacier. 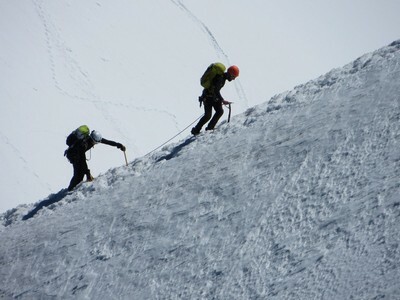 At least the ones in this photo are using ice axes. 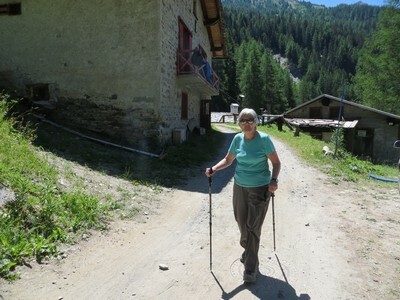 Some years back Rosemarie and I were watching and all of them seemed to just be using walking poles. We both agreed that, if it was us, we would like a better second chance to recover from any slip! 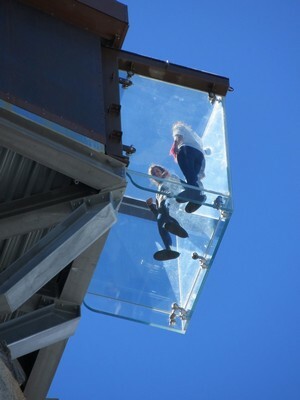 Another interesting sight is to see people who have paid to go onto the topmost level taking their turn to walk out into a glass-floored box. 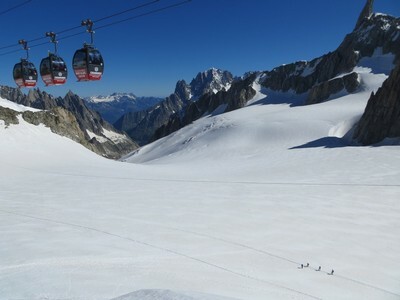 Later in the day we hoped to get places in the Chalet Alpin du Tour and we could see it in the distance at the end of the valley. We then phoned there, using a cellphone, and happily they did have enough room for us tonight and (previously booked) tomorrow night. 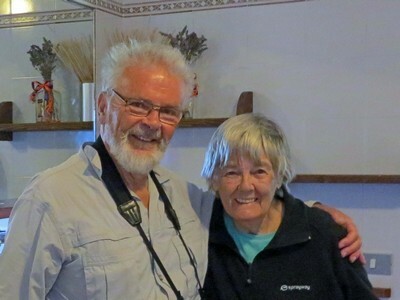 One thing we had hoped to do during our holiday was to spend a night in the delightful Bel Lachat refuge near the ridge on the opposite side of the valley. All we managed on this trip was to take a telephoto picture of the Bel Lachat in the distance. 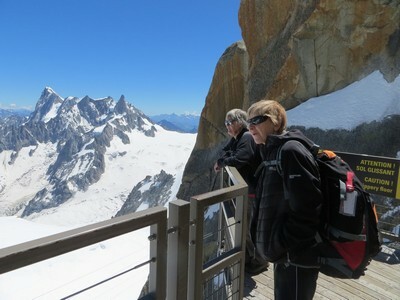 Having secured our beds for the night we could relax and enjoy the many viewing platforms available on the Midi. The sun was bright, the air cool and transparent. Perfect to get the best from our wonderful surroundings. 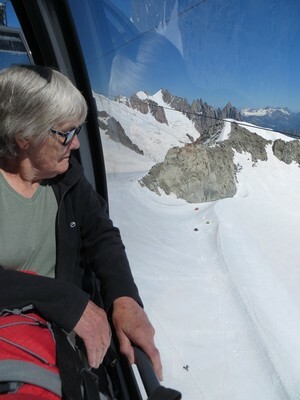 Finally we had to continue downwards, although not without a stop at the Buvette du Plan de l'Aiguille as we changed carriages on the way down. 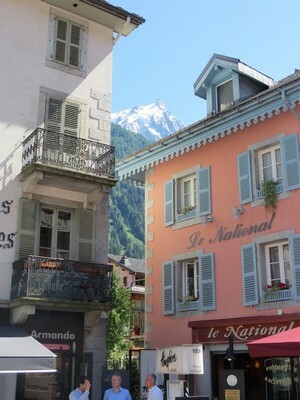 Once in the valley we wandered through the sunny streets of Chamonix. 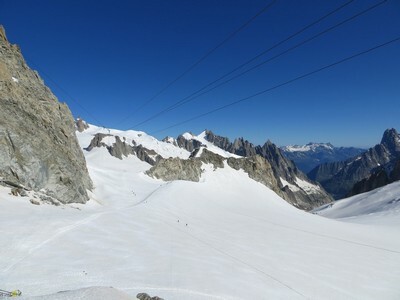 We even had a chance to look back up at the Aiguille du Midi before catching the bus to le Tour. 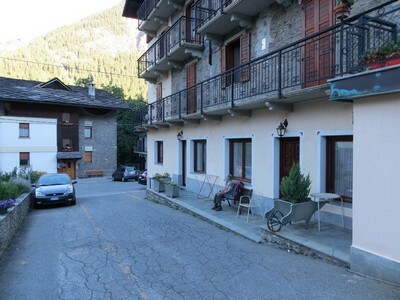 After depositing our luggage in our room there was still some time to have a look at the nearby house where Michel Croz had his home before his untimely death on the first ever ascent of the Matterhorn from Zermatt. 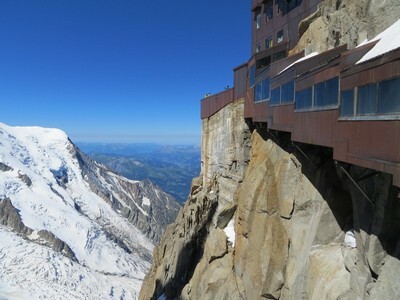 Then an excellent meal in the Chalet Alpin du Tour. A really perfect day! 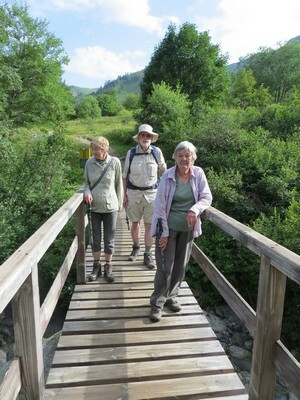 We spent it walking from le Tour to les Praz du Chamonix. Then, after dinner, getting packed and paid-up for an early start tomorrow on our journey home. Up early and away to Geneva Airport. Then a flight home and the end of our holiday. 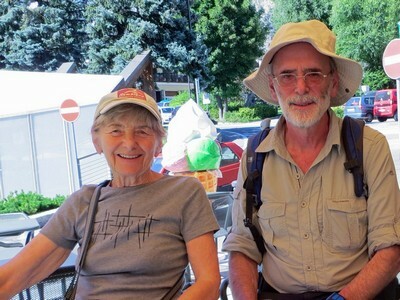 The photo is of our two "invalids" looking fit, well and happy! 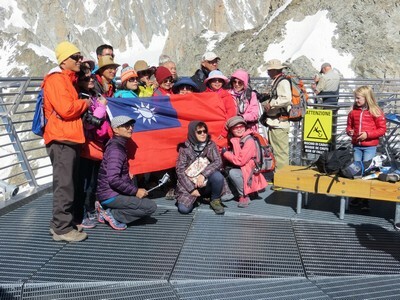 Photo taken near the end of our tour.